beautiful! I love the heart cutouts and the fun pattern papers. Striking page. Your lovely photo is highlighted beautifully by the border of hearts and flowers. This is a great keepsake page. Oh this is perfect Kjersti. I love the photo and how you used the kit and template. Beautiful layout as always. Gorgeous page, Kjersti! I love all the hearts and the clustering! So gorgeous! Love all the patterns in the hearts and those lovely corner clusters. Fantastic layout! Beautiful page - you clustering is always amazing and so are your pictures of you and your beautiful girls! This is gorgeous, Kjersti!! You could frame this! You are both so beautiful! I love your paper choices for the heart frame. Your clusters are fantastic! I love the wooded background and all the filled hearts! Absolutely stunning layout, I love everything here! Soooo gorgeous Kjersti! 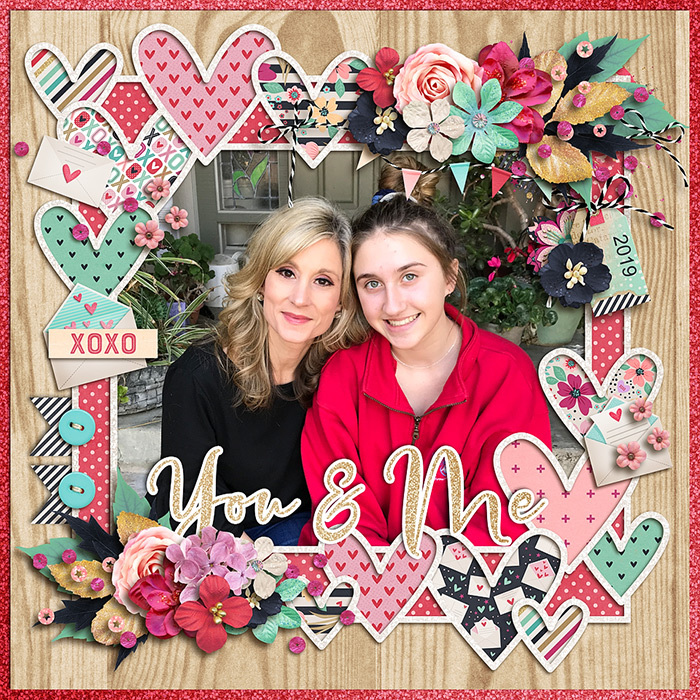 Love all the patterned papers in the heart cutouts...super cute!